I've grown into a real stout fan over recent months and when the guy in the beer shop suggested this one, I wasn't going to not buy it. This stout is from one of the breweries that sparked my love of different beer, as strange as it sounds you should try the St Ambroise Apricot beer! The difference between an American Imperial Stout and a Russian Imperial Stout is vast, the Russian Imperial stout is a bigger fuller flavoured stout with huge roasted malts. The American variation often has cleaner alcohol tastes and is generally sweeter than it's Russian equivalent. The Russian Imperial Stout is often considered the king of all stout varieties, and I'm really hoping this is one of the better ones. 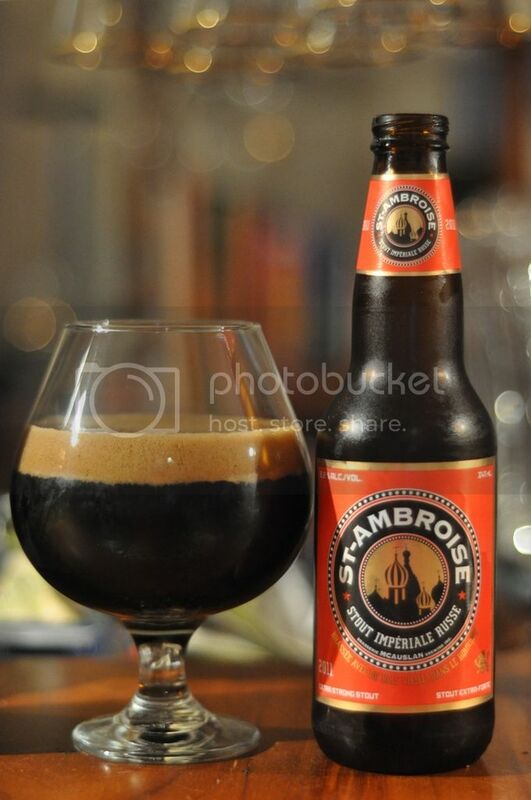 Like a typical stout the Russian Imperial from St. Ambroise pours an almost black colour. The beer is completely opaque, absolutely no chance for light to get through this one. As for the head, it's quite a dark brown colour and of a good size. The head has excellent retention for an Imperial Stout and when the head finally settles down it forms a thick ring around the glass with a thin film over the surface of the beer. The lacing is superb, and this is a sensational looking stout! On the nose there are obviously large ammounts of roasted malts. I should have mentioned earlier that this beer is aged in a bourbon wood barrel, and you can really smell the rich wood and I also get hints of bourbon on the nose. It has hints of coffee on the end of the nose, as well as something that I believe is cherry on the end which adds a touch of sweetness to the nose. It's a very complex smelling beer and I don't think this review has done what I can smell justice. Normally when I write one of these reviews I take a sip and instantly know what I'm going to write, this beer I've got no idea how to do it justice. Ok so there are loads of roasted malts, and this beer is actually smokier than I expected. There are flavour pockets of bourbon but I'm really getting a strong coffee flavour, which is ust delicious. I can hardly taste any alcohol at all, which is impressive in a 9+% beer. It's superb! All the things I've heard about this beer are true this is a sensational beer, and one that I would more than happily drink again. I'm so thankful I bought 3 other ones which I will age for the next couple of years. Anyway this stout is incredible, it comes in a cool cardboard tube and at about $13 a pop it's not cheap but it's absolutely worth every cent! It's an incredibly enjoyable beer, definitely one for stout lovers!